The PriestMartyr Ermogen, Patriarch of Moscow and all Rus', was descended from the Don Cossacks. In the testimony of the Patriarch himself, he was priest in the city of Kazan at a church, near the Kazan bazaar, in the name of Sainted Nicholas (Comm. 6 December and 9 May). Soon he became a monk and from 1582 was archimandrite of the Saviour-Transfiguration monastery at Kazan. On 13 May 1589 he was ordained bishop and became the first Kazan metropolitan. During the service of His Holiness the Patriarch at Kazan there occurred the appearance and discovery of the Wonder-Working Kazan Icon of the Mother of God in the year 1579. Being then still only a priest, but with the blessing of the then Kazan archbishop Jeremii, he carried the newly-appeared icon from the place of its discovery to the Church of Saint Nicholas. Having remarkable literary talent, the saint himself in 1594 compiled an account about the appearance of the wonderworking icon and the miracles accomplished through it. In 1591 the saint gathered newly-baptised Tatars into the cathedral church and during the course of several days instructed them in the faith. In 1592 there was the transfer of relics of Sainted German, the second archbishop of Kazan (Comm. 25 September, 6 November, and 23 June), who had died at Moscow on 6 November 1567 during the time of a pestilential plague, and buried in Saint Nicholas Church. With the blessing of Patriarch Job (1589-1605), Saint Ermogen made the re-burial at the Sviyazhsk Uspenie monastery. On 9 January 1592 Saint Ermogen directed a letter to Patriarch Job, in which he stated that at Kazan there was celebrated no particular remembrance of the Orthodox soldiers, who gave their life for the Faith and Fatherland beneathe Kazan, and he petitioned to establish an assigned day of memory. At the same time he reported about three martyrs who had suffered at Kazan for their faith in Christ, – one of which was a Russian by the name of John (Comm. 24 January) born at Nizhny Novgorod and captured by the Tatars, while the other two, – Stephen and Peter (Comm. 24 March) were newly-converted Tatars. The saint expressed regret that these martyrs were not inserted into the synodikon read on the Sunday of Orthodoxy, and that memory eternal was not sung for them. In answer to Saint Ermogen, the Patriarch issued an ukaz (decree) of 25 February, which decreed: – "for all the Orthodox soldiers, killed at Kazan and the Kazan surroundings, to celebrate at Kazan and throughout all the Kazan metropolitanate a panikhida on the Saturday following the (1 October) feastday of Pokrov / Protection of the MostHoly Mother of God, and to inscribe them in the great synodikon read on the Sunday of Orthodoxy", and ordered to inscribe in the synodikon also the three Kazan martyrs, entrusting to Saint Ermogen to set the day of their memory. Saint Ermogen circulated the Patriarchal ukaz throughout his diocese, adding, that in all the churches and monasteries they should celebrate liturgy and panikhida for the three Kazan martyrs and should remember them also at litya and liturgy on 24 January. Saint Ermogen displayed zeal in the faith and firmness in the observance of church traditions, and he concerned himself with the enlightening of Kazan Tatars by the faith of Christ. In 1595, with the active participation of the saint there occurred the discovery and opening of the relics of the Kazan Wonderworkers: Sainted Gurii, the first archbishop of Kazan (Comm. 4 October, 5 December, 20 June), and Sainted Varsonophii bishop of Tver' (Comm. 4 October, 11 April). Tsar Feodor Ioannovich (1584-1598) had given orders to erect at the Kazan Saviour-Transfiguration monastery a new stone church on the place of the first one, wherein the saints were buried. When the graves of the saints were discovered, Saint Ermogen came with a gathering of clergy, he commanded the graves to be opened and, having beheld the undecayed relics and garb of the saints, he notified the Patriarch and the tsar. With the blessing of Patriarch Job and by order of the tsar, the relics of the newly-appeared wonderworkers were placed in the new church. 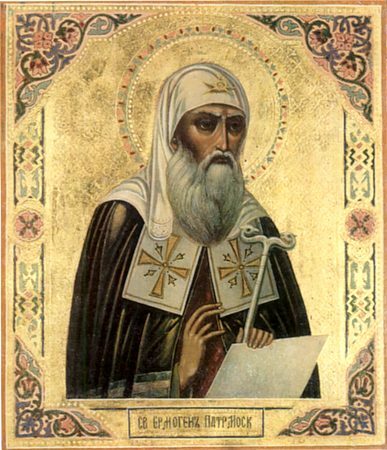 Saint Ermogen himself compiled the lives of Sainted-hierarchs Gurii and Varsonophii. Having been deigned the arch-pastoral position – metropolitan Ermogen was chosen to the arch-hierarchical cathedra (chair), and on 3 July 1606 he was elevated to the assemblage / sobor of sainted-hierarchs upon the Patriarchal throne at Moscow Uspensky (Dormition) cathedral. Metropolitan Isidor handed the Patriarch the staff of Sainted-hierarch Peter, Moscow WonderWorker (Comm. 5 October, 21 December, 24 August), and the tsar gave as a gift to the new Patriarch a panagia, embellished with precious stones, a white klobuk and staff. In the ancient manner Patriarch Ermogen made his entrance upon a donkey. The activity of Patriarch Ermogen co-incided with a difficult period for the Russian state – the incursion of the imposter the False-Dimitrii and the Polish king Sigismund III. The arch-hierarch devoted all his powers to the service of the Church and the Fatherland. Patriarch Ermogen was not alone in this exploit: his self-sacrificing fellow-countrymen copied his example and assisted him. With an especial inspiration His Holiness the Patriarch stood up against the traitors and enemies of the Fatherland, who wanted to install Uniatism and Western Catholicism in Russia and to wipe out Orthodoxy, while enslaving the Russian nation. When the imposter arrived at Moscow and settled himself at Tushino, Patriarch Ermogen dispatched two missives to the Russian traitors. In one of them he wrote: "...You have forgotten the vows of our Orthodox faith, in which we are born, baptised, nourished and raised, ye have violated the oath and the kissing of the cross to stand to the death for the house of the MostHoly Mother of God and for the Moscow realm, but have fallen for your false would-be tsarlet... My soul aches, my heart is sickened, all within me agonises, and all my frame doth shudder; I weep and with sobbing I lament: have mercy, have mercy, brethren and children, on your own souls and your parents departed and living... Consider, how our Fatherland is devastated and plundered by foreigners, who offer insult to the holy icons and churches, and how innocent blood is spilled, crying out to God. Think, against whom do ye take up arms: is it not against God, Who hath created you? Is it not against your own brothers? Do ye not devastate your own Fatherland?... I adjure you in the Name of God, give up your undertaking, there is yet time, that ye perish not at the end". In the second gramota / document the Arch-hierarch appeals: "For the sake of God, come to your senses and turn round, gladden your parents, your wifes and children; and we stand to pray God for you..."
Soon the righteous judgement of God was realised upon the Tushino thief: a sad and inglorious fate befell him just as it did his predecessor [another false-Dimitrii]; – he was killed by his own close associates on 11 December 1610. But Moscow continued to remain in peril, since in it were situated the Poles and traitor-boyars, having made betrayal to Sigismund III. The gramoti / documents, dispatched by Patriarch Ermogen throughout the cities and villages, exhorted the Russian nation to liberate Moscow from the enemies and to choose a lawful Russian tsar. The Muscovites raised up a rebellion, in answer to which the Poles burned the city, and shut themselves up within the Kremlin. Together with Russian traitors they forcefully seized hold of Patriarch Ermogen from the patriarchal throne and imprisoned him in the Chudov monastery under guard. On Bright Monday in 1611 the Russian militia approached Moscow and began the seige of the Kremlin, which continued for several months. Besieged within the Kremlin, the Poles many a time sent messengers to the Patriarch with the demand that he order the Russian militia to leave the city, threatening for refusal a death by execution. The saint firmly replied: "What are your threats to me? Only God do I fear. If all of you, Lithuanian people, go from the Moscow realm , I shall bless the Russian militia to go from Moscow, but if ye remain here, I shall bless all to stand against you and to die for the Orthodox faith". While still in prison, the Priest-martyr Ermogen turned with a final missive to the Russian nation, blessing the liberating army against the invaders. The Russian commanders could not come to an agreement over a way to take the Kremlin and free their Arch-hierarch. He languished more than nine months in dreadful confinement, and on 17 February 1612 he died a martyr's death from starvation. The liberation of Russia, for which Saint Ermogen stood with such indestructible valour, was successfully concluded by the Russian nation. The body of the Priest-martyr Ermogen was buried in the Chudov monastery, but in 1654 was transferred to the Moscow Uspenie cathedral. The glorification of Patriarch Ermogen into the rank of Sainted-hierarchs occurred on 12 May 1913.